Explore spooky dungeons, find glorious treasure, buy powerful magic items and challenge the most horrible creatures. Will your party be able to defeat the final boss? 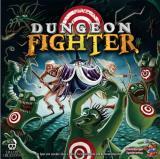 Dungeon Fighter is the first game where your skill determines the ability of your character. Can you kill Medusa without looking into her eyes, defeat the Minotaur in the labyrinth, or resist the breath of the dragon? Will you be able to hit a target by throwing the dice under your leg with your eyes closed? You will feel truly part of a centuries-old battle between good and evil...with a touch of foolish stupidity.